Creole Shrimp Tacos – This recipe starts with this creole seasoning. I love creole seasoning because it has so many spices that are well combined, and most of all, the creole seasoning add a kick to the tacos. It’s the perfect seasoning to add to this shrimp taco recipe along with fresh lemon juice to take it another notch! 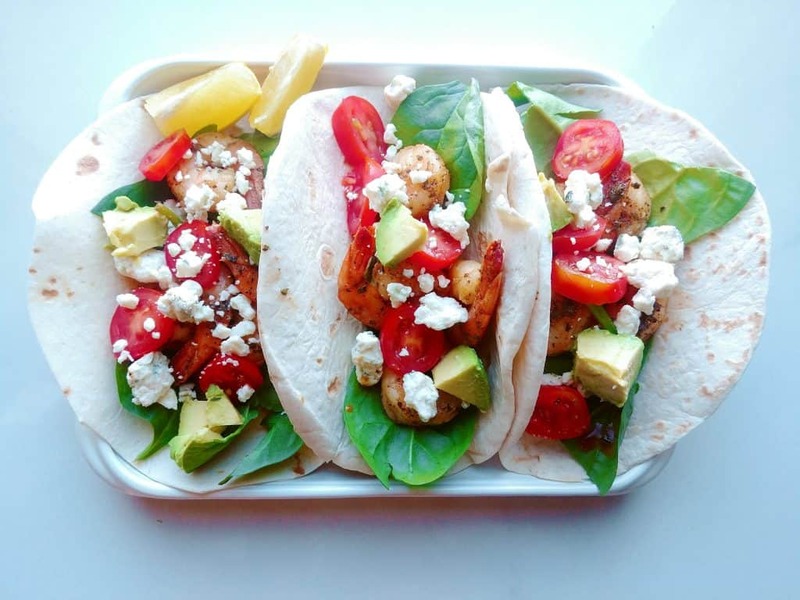 Spicy shrimp paired with a refreshing fresh spinach, tomatoes, and on flour tortillas! These Creole Shrimp Tacos are made with bold ingredients to take the shrimp taco recipe to the next level with rich Creole flavors! These tacos are not only delicious but are the most flavorful tacos you’ll ever try! Friends, I’m sure by now you know how much I love spicy food. Hence my Pikliz – Spicy Coleslaw Recipe. I love bold flavors, and this spicy shrimp tacos recipe is just that…BOLD! Spices included are cayenne pepper, ground pepper, parsley, salt and pepper, and garlic to name a few. By the way, did I mentioned for this recipe I used the already cooked shrimp which makes it another “15 minutes or less” recipe :). With just a few ingredients you will have a party in your mouth with this Bold Spicy Creole Shrimp Tacos recipe. These tacos are delicious and the perfect way to end a long day! Savory Thought: Every day provides you with a NEW opportunity to try something NEW. 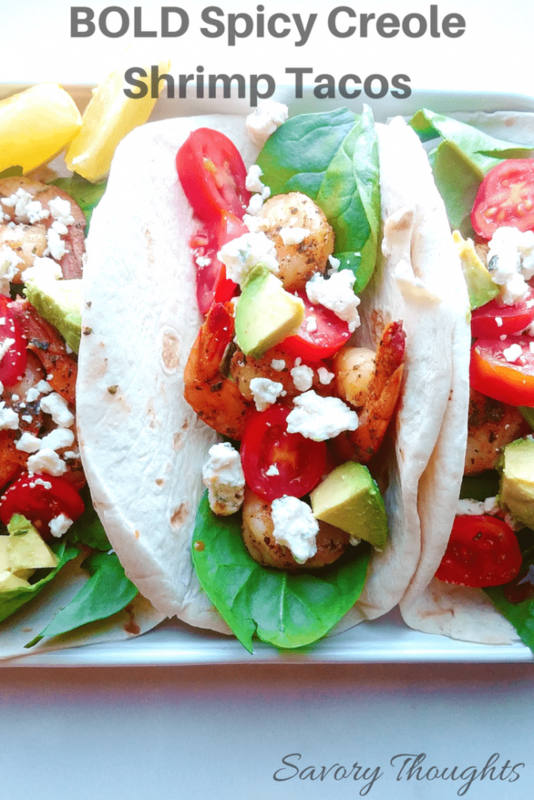 These Bold Spicy Creole Shrimp Tacos are made with bold ingredients to take the shrimp taco recipe to the next level with Creole flavors! These tacos are not only delicious but are the most flavorful tacos you'll ever try! Add the shrimp to the heated oil and cook for 3 minutes; stirring a few times to avoid sticking. Reduce the heat to low and instantly add the above ingredients in order starting with the basil. Stir and cook for 2 minutes then remove from heat. Assemble in a soft tortilla with your preferred toppings. I bought the already cooked shrimp. I would recommend removing the tail before "cooking" the shrimp. 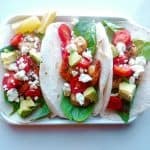 This taco recipe is great with fresh spinach, avocados, and grape tomatoes. Consider this recipe if you are also feeding a large crowd. Thank you, LamBam. Glad you enjoyed the post! This sounds amazing! Will definitely try it soon! Oh my godddd this looks heavenly, even though I don’t like shrimp! I’ll have to replace with another meat cause man I am craving these now! If you love red meat, veal is also great with this seasoning. Thanks for reading, Courtney! I love love loveee everything about this recipe. Tacos are amazing but to have two of my favorite dishes in one would be unreal and I must try. Definitely! Please let me know how you like it. Excited for you to try them, and the lemon juice sprinkled on top just takes you to another world! Delicious! My taco loving family would love these. I can’t wait to try them. P.s. your photos just makes me want to eat it right now. Looks so fresh and tasty. Love it! Haahaha! Thank you, Jenna! They were incredibly delicious. You must try them. Very easy to make. These look amazing! I love shrimp tacos, especially when they are quick and easy like this recipe. Can’t wait to try them! Mmmm these look and sound delicious, especially the shrimp part of it. Thank you for sharing I am always looking for new things to cook. OMG, this looks so good. 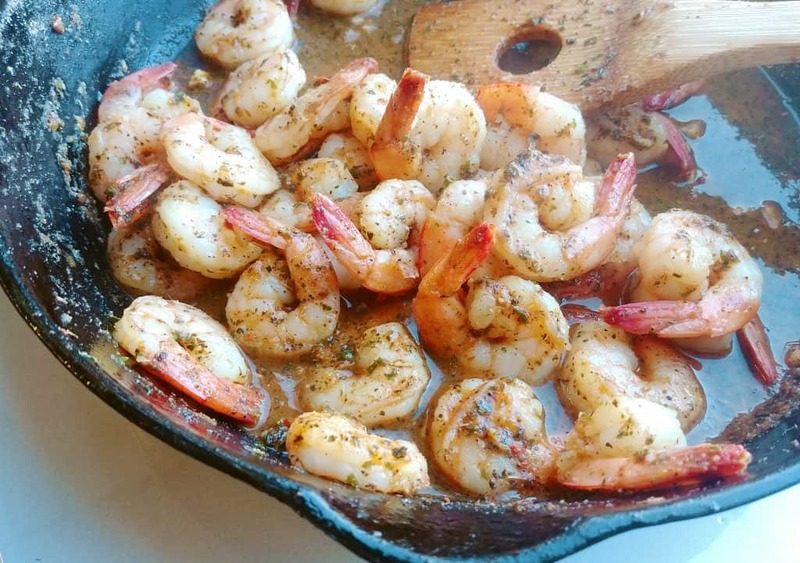 I love shrimp and the spice of Creole seasoning. I will have to give this ago the next time I have tacos. They were delicious! You must try them, Luci! Looks delicious! My husband doesn’t eat shrimp so more for me and the kids! What kind of cheese is that on top? That’s right! It’s more for you and the kids 🙂 the cheese on top is Feta. Thanks for reading, April! These look so yummy and fresh! I think I’ll have to make these tonight seeing as the weather is getting warmer! I am so glad the weather is moving on to the warm side. I would love to hear how you like it, Leigh! We love tacos…and these look fantastic. What a fun meal on the weekend. Homemade tortillas would be perfect here. The family would enjoy this for sure.